Kayak vs Canoe - Which is better and Why? What are the Benefits of a Kayak over a Canoe? Kayak enthusiastic are quick to say kayaking is the best activity in the world. They claim kayaking is much better than canoeing and we’re here to put this to the test. Let’s start with some basics. What’s the difference between a kayak and a canoe? A canoe is a small boat in which you sit or kneel facing forward and use a single-bladed paddle to move forward, using your body strength. Usually, it sits two people. A kayak is a small boat in which one person sits facing forward, with their legs in front of them and uses a double-bladed paddle to propel themselves forward. The difference in the boats comes down to the sitting position and the type of paddle you use. There is no doubt that both canoeing and kayaking are entertaining activities, which call for a lot of strength and determination. These activities are not for the weak-willed. Threading the water and letting your strength take you places is a dream for many. Choosing one or the other depends on what you’re looking for. Kayaks are lighter and easier to transport. They’re also better for rough water. They are also slightly faster and much easier to paddle. A beginner kayaker can get by without any instructions, but the canoeist will need some training. The learning curve is easier to manage for kayaking at first. A kayak is easier to paddle due to the less wetted surface area, which is why a lot of people like kayaks more. Also, even though it’s not much simpler to use a double paddle, it is much more efficient. There are many different types of kayaks. The choices vary from recreational kayaks, to fishing kayaks, to inflatable ones. It all depends on the purpose of the purchase of one and the personal style of the buyer. Some of the best kayak brands will offer a wide variety of choice and even help out with the selection process. Some of the best options for a recreational beginner’s kayak would be the Sun Dolphin Aruba 10, the Pelican Matrix 100X or the Perception Prodigy 10. Intex is also a very reliable brand which offers a big selection of inflatable kayaks and boats. Their intex excursion 4, for example, shows that family fun has never been closer. It even has an option of attaching a motor to your boat, making for a smoother and faster ride. It’s also quite affordable and light. This short Intex Excursion 4 review shows what type of things one should look for when searching for the right type of boat for themselves. 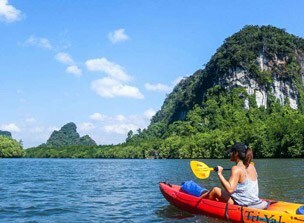 Kayaking is a fun newly favorite fitness activity everyone is trying out. It’s a great upper body work out and healthy in general, as you will spend some more time outdoors. 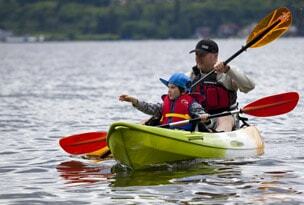 It’s adaptable and almost everyone can find a suitable type of kayak for them. What are you waiting for? Try it out and let me know how it went in the comments below.